But here is something very nice. Sunday's episode is teh highest rated episode that didn't have any form of sports overrun for the full year Cycles 13 and 14. And since moving to Sunday it is the 4th highest rated episode that didn't have the benefit of a sports overrun. The fans have found TAR and like the timeslot. 60 Minutes is a nice lead-in and the news magazine has had a bang up season with the Obama interviews and big "gets". Plus, the audience also likes "Cold Case". I hope CBS does not break up this lineup because it's a highly rated one. Certainly better to have TAR at 8 p.m. instead of the old "Murder, She Wrote" which appealed to 80 year olds. Well as more ratings data comes out. TAR was the 27th most watched in the all important 18-49 age group (11th for CBS). And we actually had more viewers then 60 minutes. CBS raced to its 11th consecutive Sunday win in viewers led by the time period winning season finale of THE AMAZING RACE 14, a first place finish by 60 MINUTES and solid season finales for COLD CASE and THE UNIT, according to Nielsen preliminary live plus same day ratings for May 10. At 7:00 PM, 60 MINUTES was first in households (6.3/13), viewers (9.97m), second in adults 25-54 (2.1/07) and adults 18-49 (1.5/06). 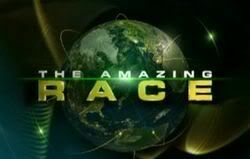 At 8:00 PM, the season finale of THE AMAZING RACE 14 was first for the sixth consecutive broadcast in households (5.9/10), viewers (10.43m), adults 25-54 (3.7/10) and adults 18-49 (3.0/09). The season finale of COLD CASE, featuring the music of Pearl Jam, was second in households (7.2/12) and viewers (11.78m) while averaging a 3.6/09 in adults 25-54 and 2.6/07 in adults 18-49. At 10:00 PM, the season finale of THE UNIT (5.8/10, 9.66m) averaged a 3.2/08 in adults 25-54 and 2.4/07 in adults 18-49. For the night, CBS was first in households (6.3/11), viewers (10.46m), tied for second in adults 25-54 (3.1/08, with NBC) and averaged a 2.4/07 in adults 18-49. I actually think it might be, certainly for this season. Damn thats quick this week. Very nice. CBS extended its viewer winning streak to 10 weeks and continues as the only network posting yearly gains in all key measures, according to Nielsen live plus same day ratings for the week ending May 10, week 33 of the 2009 television season. CBS had the week's top two scripted series-NCIS and THE MENTALIST-and seven of the top 10. This marks the 14th consecutive week CBS had the top scripted series and 30th of 33 weeks this season. CSI, NCIS, THE MENTALIST and TWO AND A HALF MEN have all had turns as Number One scripted program. With the official season heading into its final 10 days, CBS will be the only network to post yearly increases in all key measures: CBS is currently up +12% in viewers, +3% in adults 18-49 and +8% in adults 25-54. For the week in viewers: CBS (10.76m), FOX (8.82m), ABC (8.72m) and NBC (6.35m). Season-to-date, CBS is first in viewers (11.74m), ahead of FOX (9.69m), ABC (8.90m) and NBC (7.91m). For the week in households: CBS (6.8/12), ABC (5.6/10), FOX (5.3/09) and NBC (4.2/07). In households, season-to-date, CBS is first (7.3/12), ahead of both ABC and FOX (5.7/09, each) and NBC (4.9/08). For the first 18 days of the May 2009 sweep, CBS is first in households (6.6/11), viewers (10.45m), tied for first in adults 25-54 (3.4/09, with FOX) and tied for second in adults 18-49 (2.5/08, with ABC). For the week in key demographics, CBS was second in adults 25-54 (3.6/10, -0.2 behind FOX) and adults 18-49 (2.7/08). Season-to-date, CBS is first in adults 25-54 (4.1/10, tied with FOX) and second in adults 18-49 (3.1/08). ⁮ THE BIG BANG THEORY was up +2% in both households (5.8/09 from 5.7/09) and adults 25-54 (4.1/11 from 4.0/10), even in both adults 18-49 (3.4/10) and adults 18-34 (2.5/08) and added +10,000 viewers (9.25m from 9.24m) compared to last week. ⁮ HOW I MET YOUR MOTHER was up +4% in households (5.5/08 from 5.3/08), +5% in adults 25-54 (4.2/10 from 4.0/10) and added +20,000 viewers (8.89m from 8.87m) compared to last week. ⁮ TWO AND A HALF MEN was tied for first in adults 18-49 (5.0/12, with ABC), second in households (8.6/13), viewers (14.17m) and adults 25-54 (6.1/14, -0.2 behind ABC). Compared to last week, TWO AND A HALF MEN was up +5% in adults 25-54 (from 5.8/13), +2% in adults 18-49 (from 4.9/12) and added +10,000 viewers (from 14.16m). ⁮ RULES OF ENGAGEMENT was second in households (6.9/10), viewers (11.33m), adults 25-54 (5.1/11) and adults 18-49 (4.1/10). Compared to last week, RULES OF ENGAGEMENT was up +6% in adults 25-54 (from 4.8/11), +5% in adults 18-49 (from 3.9/10) and added +30,000 viewers (from 11.30m). ⁮ CSI: MIAMI was first in households (8.7/14), viewers (13.72m), adults 25-54 (5.1/13) and adults 18-49 (4.0/11). Compared to last week, CSI: MIAMI was up +10% in households (from 7.9/13), +19% in adults 25-54 (from 4.3/11), +21% in adults 18-49 (from 3.3/09) and added +1.60m viewers (from 12.12m, +13%). This is CSI: MIAMI's best delivery in households since March 16, 2009, best adults 25-54 and adults 18-49 performances since March 23, 2009 and largest audience since March 9, 2009. ⁮ NCIS was second in households (10.4/17), viewers (16.72m), adults 25-54 (4.8/12) and adults 18-49 (3.4/10). Compared to last week, NCIS was up +3% in households (from 10.1/16), even in adults 25-54 and added +20,000 viewers (from 16.70m). ⁮ THE MENTALIST was first in households (10.4/16), viewers (16.68m) and adults 25-54 (5.1/12). ⁮ WITHOUT A TRACE was first in households (7.7/13), viewers (11.83m), second in adults 25-54 (3.6/09) and adults 18-49 (2.6/07). Compared to last week, WITHOUT A TRACE was up +3% in adults 25-54 (from 3.5/09) and +4% in adults 18-49 (from 2.5/07). ⁮ CRIMINAL MINDS was second in households (8.9/14), viewers (14.13m) and adults 25-54 (4.6/10). Compared to last week, CRIMINAL MINDS was up +5% in households (from 8.5/12), +7% in adults 25-54 (from 4.3/10), even in adults 18-49 (3.3/08) and added +520,000 viewers (from 13.61m, +4%). ⁮ CSI: NY was first in households (8.5/14), viewers (13.40m), adults 25-54 (4.5/11) and adults 18-49 (3.3/09). CSI: NY beat the competition combined in viewers (vs. 12.78m, +5%). Compared to last week, CSI: NY was up +5% in households (from 8.1/14), +10% in adults 25-54 (from 4.1/10), +3% in adults 18-49 (from 3.2/09) and added +900,000 viewers (from 12.50m, +7%). ⁮ SURVIVOR: TOCANTINS was first in households (7.0/12), viewers (11.99m), adults 25-54 (4.7/13) and adults 18-49 (3.8/12). Compared to last week, SURVIVOR: TOCANTINS was up +2% in adults 25-54 (from 4.6/13), +6% in adults 18-49 (from 3.6/11), even in households and added +260,000 viewers (from 11.73m, +2%). ⁮ GHOST WHISPERER was first in households (6.0/12), viewers (9.50m), adults 25-54 (3.1/10) and adults 18-49 (2.2/08). ⁮ FLASHPOINT was first in households (5.5/10), viewers (8.62m), adults 25-54 (2.5/08) and adults 18-49 (1.8/06). ⁮ NUMB3RS was first in households (6.0/11), viewers (9.57m), adults 25-54 (2.9/09) and adults 18-49 (2.0/07). ⁮ 60 MINUTES was first in households (6.3/13), viewers (10.09m), second in adults 25-54 (2.1/07) and adults 18-49 (1.5/05). ⁮ THE AMAZING RACE 14 was first for the sixth consecutive broadcast in households (5.9/10), viewers (10.49m), adults 25-54 (3.8/10) and adults 18-49 (3.1/09). CBS top programs of the week: #4 NCIS (an average of 16.72m viewers), #5 THE MENTALIST (16.68m), #7 CSI: CRIME SCENE INVESTIGATION (14.91m), #9 TWO AND A HALF MEN (14.15m), #10 CRIMINAL MINDS (14.13m), #11 CSI: MIAMI (13.72m), #12 CSI: NY (13.40m), #15 SURVIVOR: TOCANTINS (11.99m), #16 COLD CASE (11.84m), #17 WITHOUT A TRACE (11.83m), #18 RULES OF ENGAGEMENT (11.33m), #19 THE AMAZING RACE 14 (10.49m), #22 60 MINUTES (10.09m), #25 THE UNIT (9.64m), #26 CSI 10PM SPECIAL (R) (S) (9.58m), #27 NUMB3RS (9.57m), #28 GHOST WHISPERER (9.50m) and #29 THE BIG BANG THEORY (9.25m). FOX 3.8 10 3.8 10 n.c.
FOX 2.6 9 2.6 9 n.c.
NBC 2.8 8 2.8 8 n.c.
With Final numbers out this tv season (ratings wise is all but over, just two more weeks of DVR results and thats it). The results in bold mean during the Spring season we beat any other Sunday CBS programming (I need to double check the 25-54). So how does this season compare to the rest. Well I don't have demo's (in full details except from season 7 to current) but just off of viewers. 1. Broadcast TV typically declines in viewers each and every year as more and more people get their content from other sources. By it from downloads, from DVR's or just watching cable broadcast instead of network programming. As such shows typically see declines of 5% each year (and thats actually normal). 2. With the advent of DVR more and more people are watching shows outside of the night they air. With DVR in more then 30% of homes this means that more and more viewers who do watch a program are not being included in the normal ratings. With DVR ratings season 12 is in fact the 2nd most viewed season (easily passing season 6). Season 14 should end slightly higher up this list when all that data is finally released. Canadians might find this interesting as well. Its possible that TAR 15 may not end up on CTV .